Wine merchants are always trying to come up with novel and convenient packages, and Stacked Wines has done just that: a 187ml container that is shaped like a stemless wine glass. 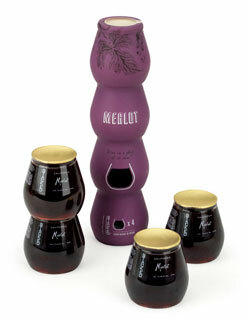 The containers stack securely, and four of them are equivalent to a standard 750 ml bottle of wine. That’s a slightly larger pour than you’d get at your local restaurant, but I suspect they’ll get few complaints. This entry was posted in Wine Glasses, Wine News and tagged stacked wines, vinoware on August 31, 2012 by Roger.